Many thanks to the generous donation of vintage CTIX cartridges from Mario at hardtec.com! It includes some pictures of the tapes and labels. I used the Tandberg TDC-3620 setup with SCSI adapter on modern Linux. I created a commemorative reproduction label set for the tape copies. Printing on 8.5x11 paper should yield the correct size. Download label image here. 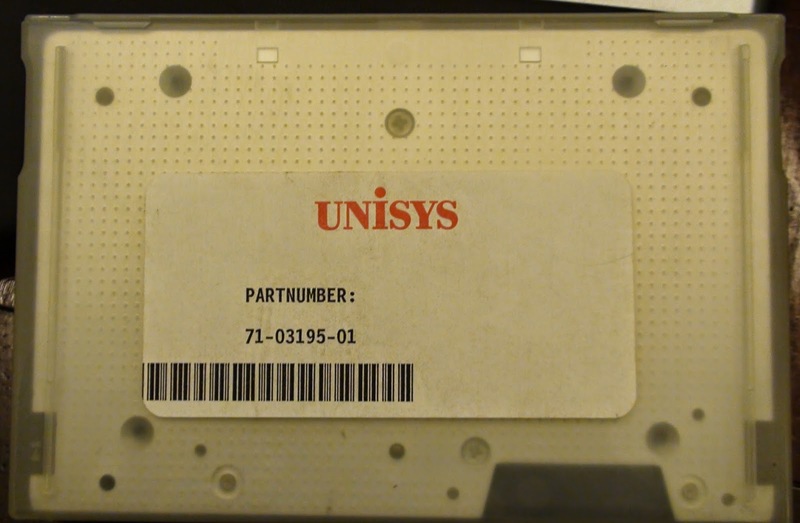 This oDesk/Upwork contractor rendered this label reproduction from a photo of the original cartridge label. I did the install on David Gesswein's MFM emulator, and therefore I have created the first ever factory-fresh MightyFrame CTIX MFM hard drive emulator file. The emulator file created as part of this process is also available here. I have 2 identical original tapes for this install version (or what should be identical), one gives me errors, and the other doesn't. Since I have a known of what to expect without errors in this situation, I'm wanting to do all experimenting and testing on the tape with errors to see if I can read "around" the errors, or through the errors, capturing all possible bytes on either side. I'll know how successful I am by comparing to the good read files. Do you have any additional suggestions for how to do this? I've started a thread about it on vintage-computer Forum. This is a major milestone for us. To the many individuals who have helped me tremendously throughout this MightyFrame restoration process, I am very appreciative. I hope to image a few more of these. > Does anyone know what files on the tape must follow the CTIX kernel file, and in what sequence, in order for it to be happy to boot entirely from tape, and perform this operation? install were there as cpio files. 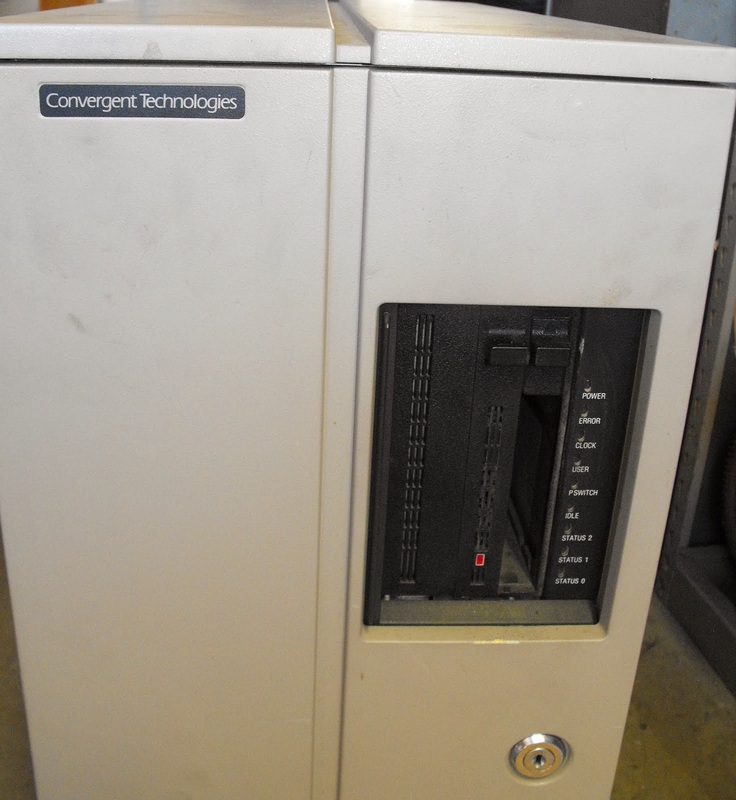 COPYRIGHT 1983,1984,1985,1986 BY CONVERGENT TECHNOLOGIES. You have an onboard ST506 drive 0. Drive /dev/rdsk/c0d0s0 has 4 user slices. Are these partition sizes satisfactory? ** Phase 2 - Writing out new VHB. ** Phase 3 - Writing out new BBT. ** Phase 4 - Allocating download areas. 5 Partitions, Bad Block Table Allocated, 1024 Block Dump Area, 290 Block Download Area. Making file system for root. Should /dev/rdsk/c0d0s3 be used for a mountable /usr? /dev/rdsk/c0d0s3 set up as /usr. Please enter the names of the CTIX software groups you would like to install. Positioning the Tape for Product Installation. Running fsck on root file system. Running fsck on /usr file system. Starting to Install Group(s) CORE MISC BCE ACE LP UUCP DOC SYSM KFIG GAMES ACCT TINFO CROSS INET ADMAN. Calculating size required for group CORE. Installation will require an additional 3396 root Blocks (512 Byte Blocks). Installation will require an additional 2840 /usr Blocks (512 Byte Blocks). Checking permissions, modes and omissions on new CORE commands. Completed Installation of Group CORE. Partition 0 requires 322 1k Blocks. Installing new download images and loader. Need 322 Blocks for Partition 0. Ignore "Adding Bad Block" Messages. 5 Partitions, 30 Blocks for Loader, Bad Block Table Allocated, 1024 Block Dump Area, 290 Block Download Area. Calculating size required for group MISC. Installation will require an additional 6 root Blocks (512 Byte Blocks). Installation will require an additional 1380 /usr Blocks (512 Byte Blocks). Checking permissions, modes and omissions on new MISC commands. Completed Installation of Group MISC. Calculating size required for group BCE. Installation will require an additional 2768 root Blocks (512 Byte Blocks). Installation will require an additional 1794 /usr Blocks (512 Byte Blocks). Checking permissions, modes and omissions on new BCE commands. Completed Installation of Group BCE. Calculating size required for group ACE. Installation will require an additional 754 root Blocks (512 Byte Blocks). Installation will require an additional 2864 /usr Blocks (512 Byte Blocks). Checking permissions, modes and omissions on new ACE commands. Completed Installation of Group ACE. Calculating size required for group LP. Installation will require an additional 0 root Blocks (512 Byte Blocks). Installation will require an additional 718 /usr Blocks (512 Byte Blocks). Checking permissions, modes and omissions on new LP commands. Completed Installation of Group LP. Calculating size required for group UUCP. Installation will require an additional 1666 /usr Blocks (512 Byte Blocks). Checking permissions, modes and omissions on new UUCP commands. Completed Installation of Group UUCP. Calculating size required for group DOC. Installation will require an additional 2822 /usr Blocks (512 Byte Blocks). Checking permissions, modes and omissions on new DOC commands. Completed Installation of Group DOC. Calculating size required for group SYSM. Installation will require an additional 678 root Blocks (512 Byte Blocks). Installation will require an additional 1398 /usr Blocks (512 Byte Blocks). Checking permissions, modes and omissions on new SYSM commands. Completed Installation of Group SYSM. Calculating size required for group KFIG. Installation will require an additional 114 root Blocks (512 Byte Blocks). Installation will require an additional 2388 /usr Blocks (512 Byte Blocks). Checking permissions, modes and omissions on new KFIG commands. Completed Installation of Group KFIG. Calculating size required for group GAMES. Installation will require an additional 1474 /usr Blocks (512 Byte Blocks). Checking permissions, modes and omissions on new GAMES commands. Completed Installation of Group GAMES. Calculating size required for group ACCT. Installation will require an additional 78 root Blocks (512 Byte Blocks). Installation will require an additional 614 /usr Blocks (512 Byte Blocks). Checking permissions, modes and omissions on new ACCT commands. Completed Installation of Group ACCT. Calculating size required for group TINFO. Installation will require an additional 992 /usr Blocks (512 Byte Blocks). Checking permissions, modes and omissions on new TINFO commands. Completed Installation of Group TINFO. Calculating size required for group CROSS. Installation will require an additional 5950 root Blocks (512 Byte Blocks). Installation will require an additional 0 /usr Blocks (512 Byte Blocks). Checking permissions, modes and omissions on new CROSS commands. Completed Installation of Group CROSS. Calculating size required for group INET. Installation will require an additional 1104 root Blocks (512 Byte Blocks). Installation will require an additional 846 /usr Blocks (512 Byte Blocks). Checking permissions, modes and omissions on new INET commands. Completed Installation of Group INET. Calculating size required for group ADMAN. Installation will require an additional 1154 /usr Blocks (512 Byte Blocks). Checking permissions, modes and omissions on new ADMAN commands. Completed Installation of Group ADMAN. No tape/Non bootable tape, skipping.